Never again will a deviled egg go unpickled in this house. What started as an aesthetic curiosity has now become a cult following, I am that cult, a cult of one. 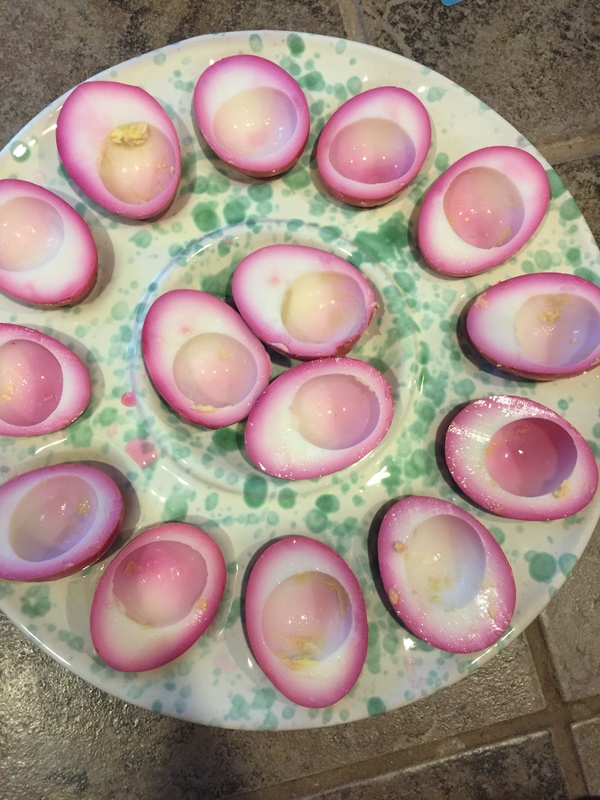 Beet-pickled eggs, wow, I saw a pretty picture on epicurious and had to try them out. 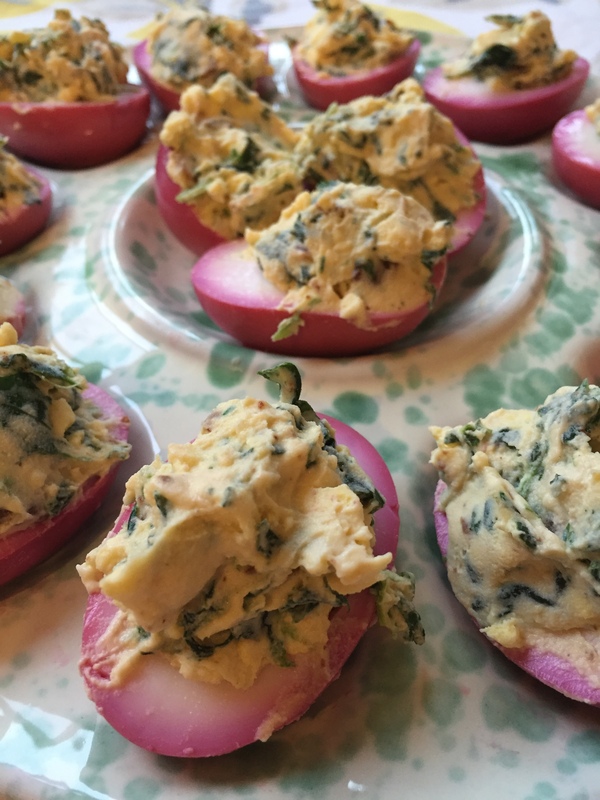 What I didn’t realize was that a night spent in vinegar and beet juice would not only make my deviled eggs beautiful, but it would take them to a whole other level of deliciousness, a level that I really would have never imagined possible. 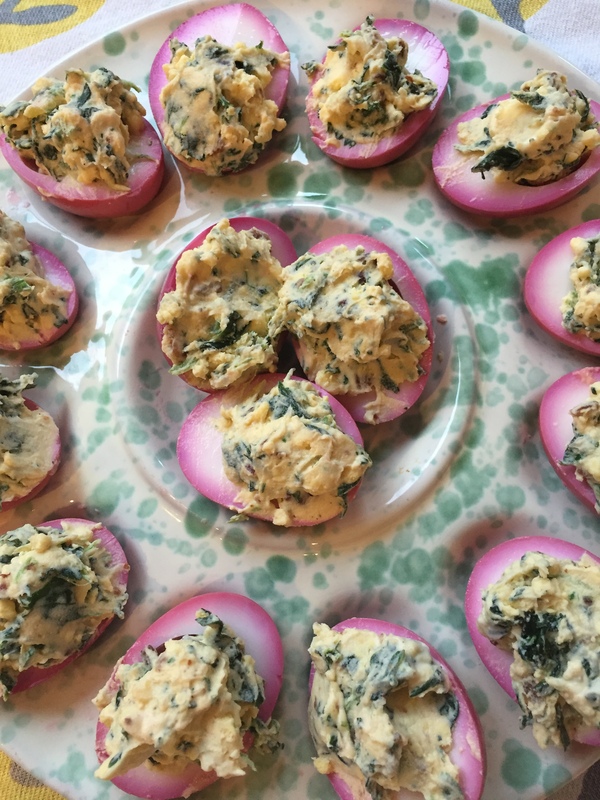 I first made them with a traditional deviled egg filling, classic southern deviled eggs, can’t go wrong with that. 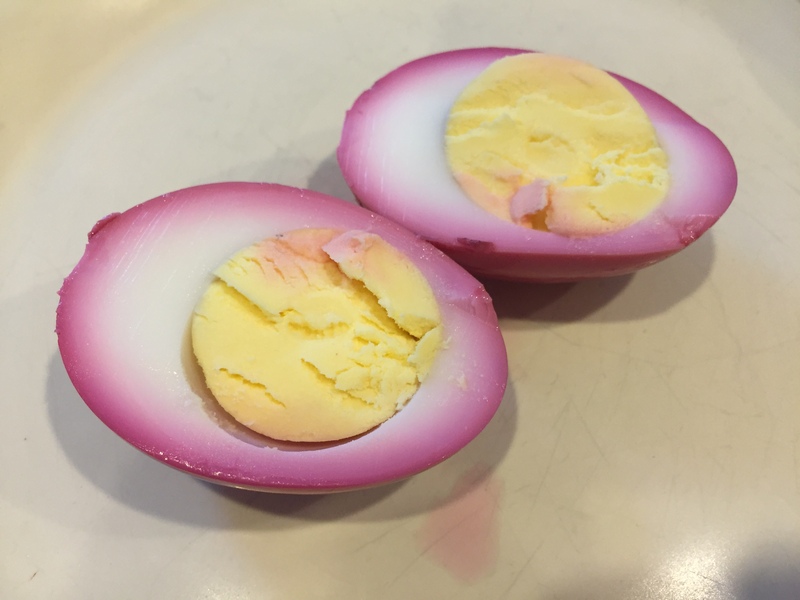 They were delicious, of course, the beet-pickled gave them that tang that simple deviled eggs sometimes need. 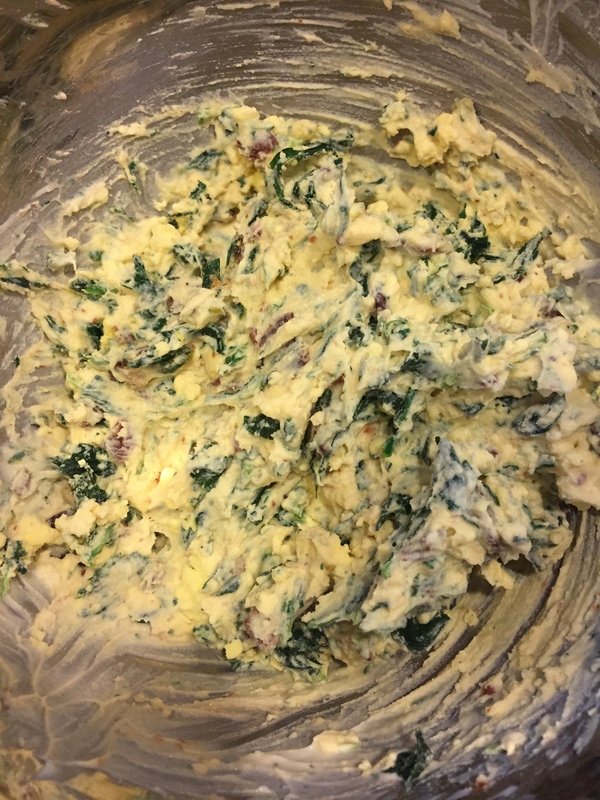 I used a recipe that my friend Regina gave me the 2nd time I made them, this has become my favorite way to make deviled eggs, with a filling of spinach and bacon, truly decadent. These friends, fellow Atlantans, scarfed up those eggs in a few minutes, licking their chops and their fingertips with satisfied pleasure, I must say that it was a proud moment for me. I love someone who can really appreciate a good deviled egg as much as I can. In a medium pot, mix 1 cup apple cider vinegar, 1 tablespoon sugar, 2 teaspoons salt, and 3 cups water. 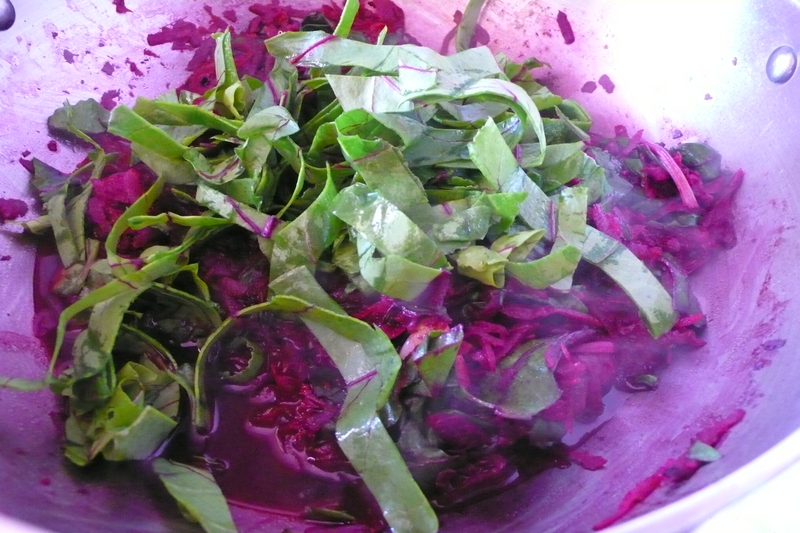 Add the beet and bring to a boil, then remove from heat and let cool slightly. 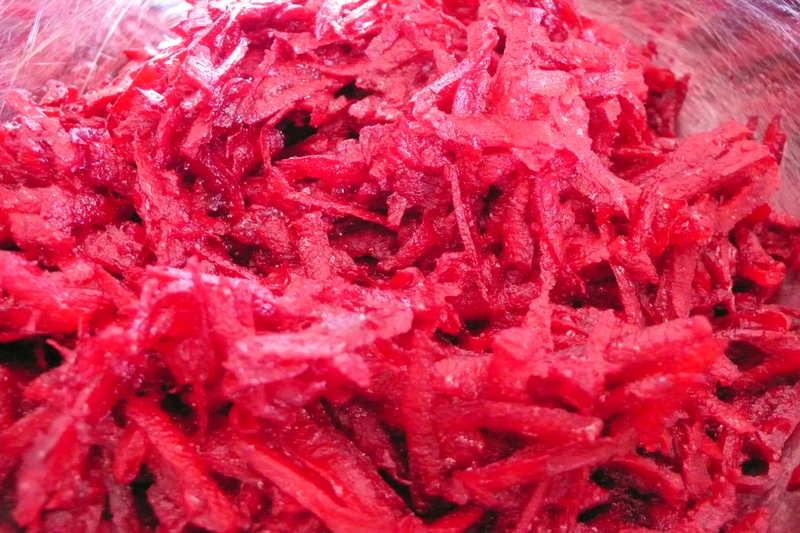 Pour into a large heat-safe jar or bowl (including beet). 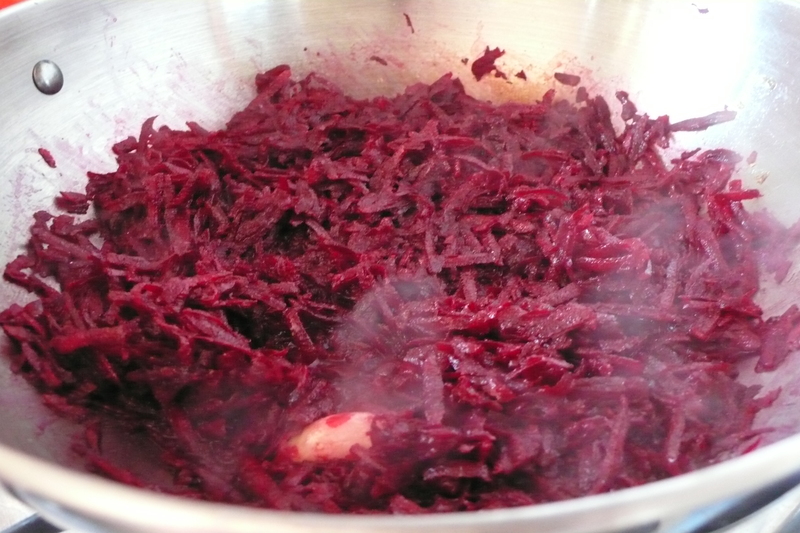 Add eggs, stir, and refrigerate at least 3 hours (stirring occasionally) or overnight for a darker shade of pink. 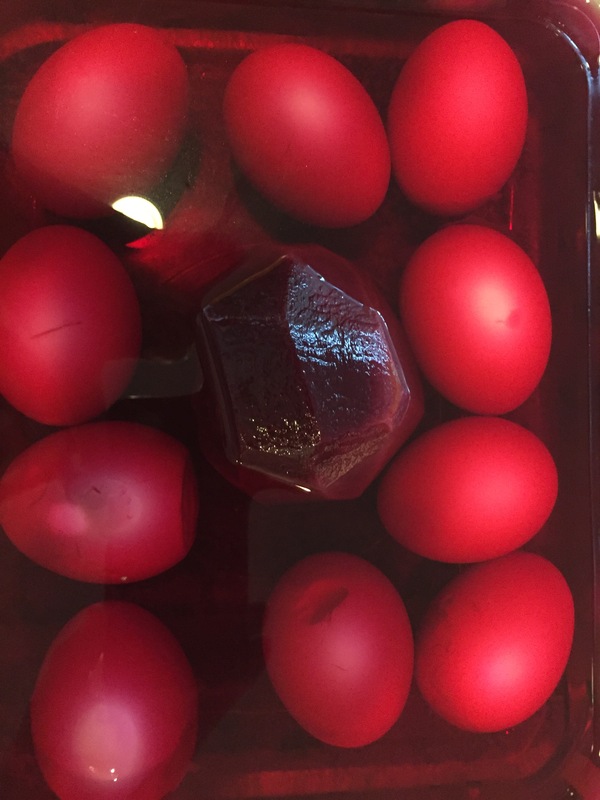 Remove eggs from liquid. Halve eggs lengthwise, and carefully scoop out yolks. Place yolks in a bowl, and mash with a fork. Mix the remaining ingredients in with the yolks. Fill each egg white with about 1 1/2 teaspoons of the egg-yolk mixture and dust the top with paprika. 7 years! It is shocking that another year has gone by and we find ourselves on the opposite end of the world, again. Italicious has served in some ways as a log for the past 7 years of my life, it has travelled with me through our first few years of marriage, through my first go at motherhood, through some serious heartbreak and then through the joy that came from the birth of my youngest daughter. It has travelled with me through the last few months of our life in Rome, with that dimly lit kitchen and warming up to writing my own recipes. It moved to Charleston where I became part of such a rich food community as a board member of Slow Food Charleston and just soaked up the awesome food culture that thrives there. 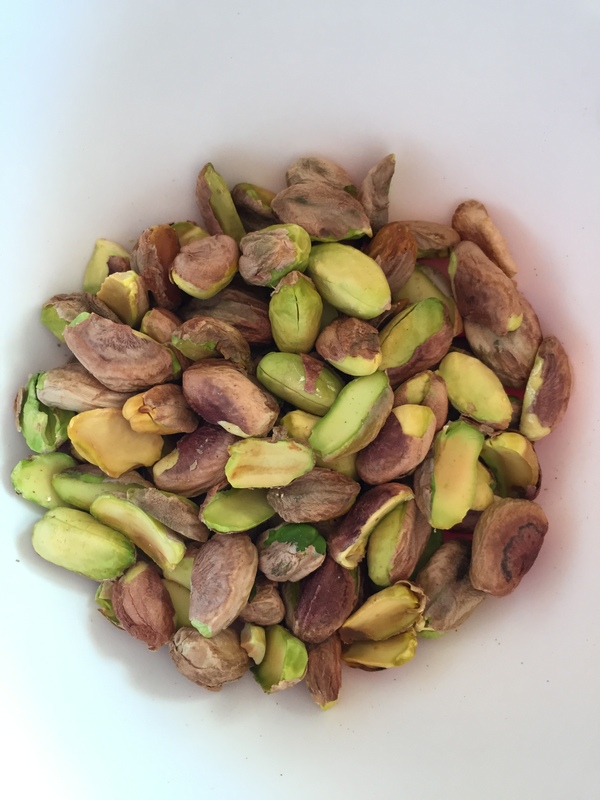 Then on to the rich agrarian Puglia where every trip to the market uncovered a new treasure, every knock on the door from a neighbor with something homemade that they wanted to share with us, I miss those orecchiette that Domenica would bring us. Now we find ourselves in the Pacific Northwest, this Southern-East Coast girl and I still don’t know what to make of it. I can’t wait to look back on this a year from now and see how far I’ve come. 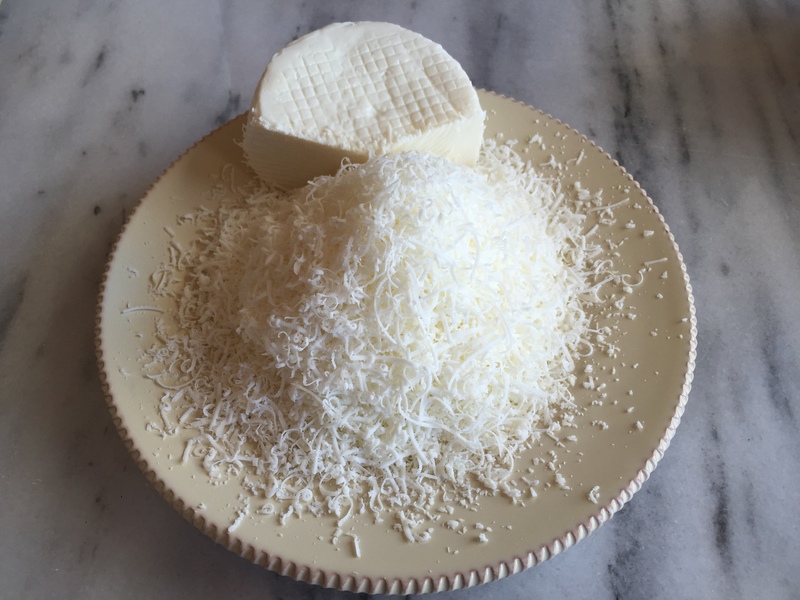 This is one of the last recipes that I have left from our life in Puglia, it is a very traditional recipe, taken from a wonderful Slow Food restaurant in Ceglie Messapica, Cibus. 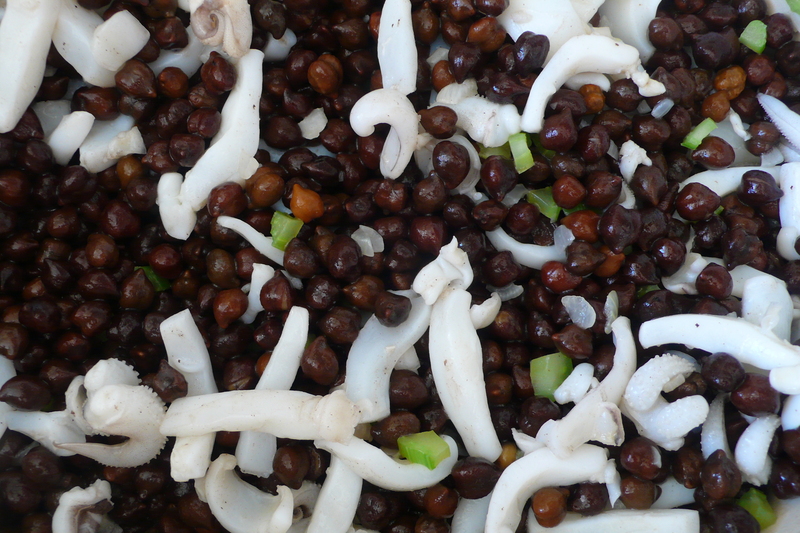 Black chickpeas are fairly easy to find in those parts, and even though they take twice the amount of time to cook, they are much nuttier in flavor and pair so perfectly with seafood. I tried this recipe at Cibus with baccalà, salted cod as a soup, it was creamy and delicious, when I came across this recipe in my Puglia cookbook, I knew I had to try it at home. 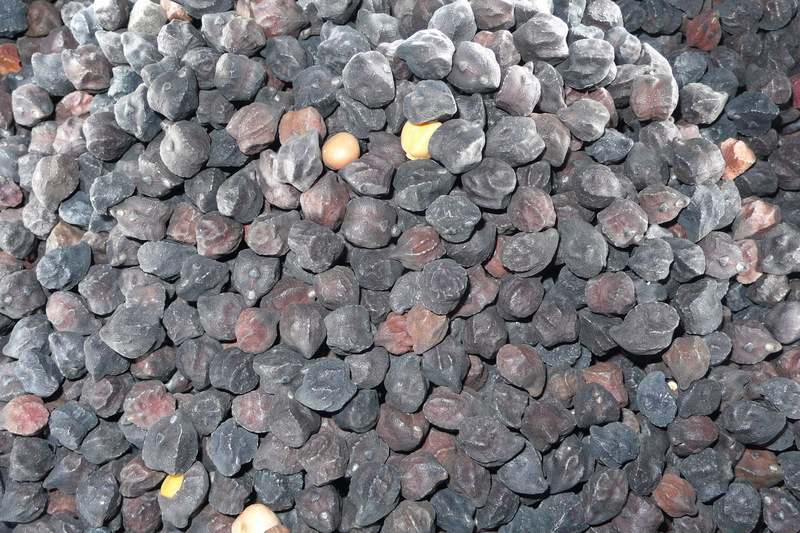 Soak your chickpeas overnight, then rinse them and cook them in salty water. 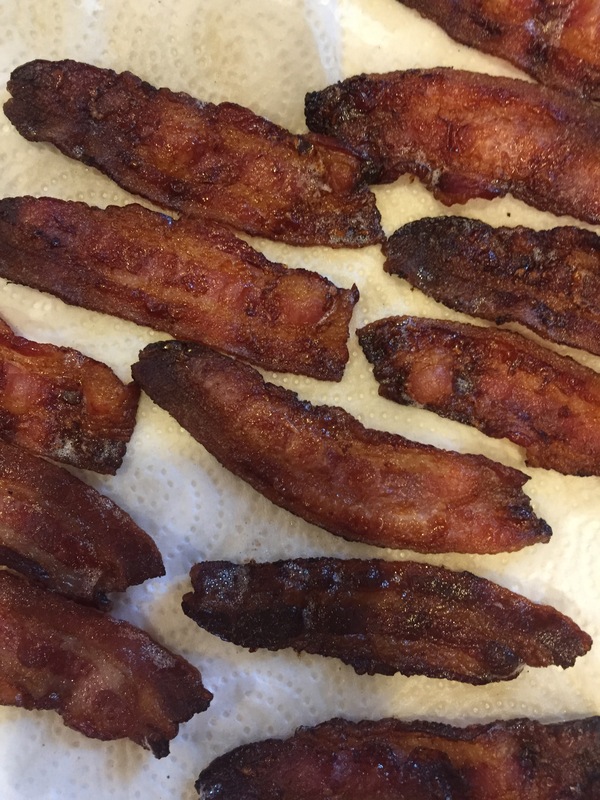 Use whatever you find works best, pressure cooker, crock pot or just a slow (2 hour!) cook on the stove, the recipe just tells you to boil them! 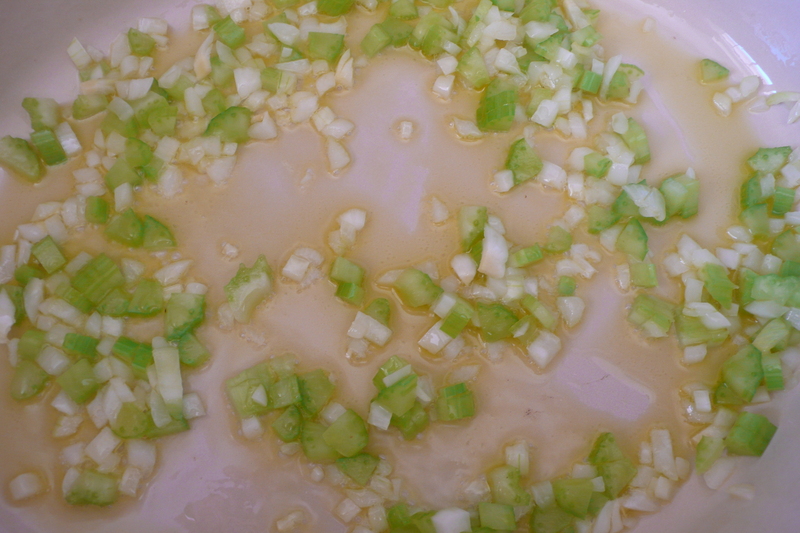 In a heavy bottomed soup pot heat the olive oil over medium heat and add the shallots and the celery, cooking them until they become transparent. 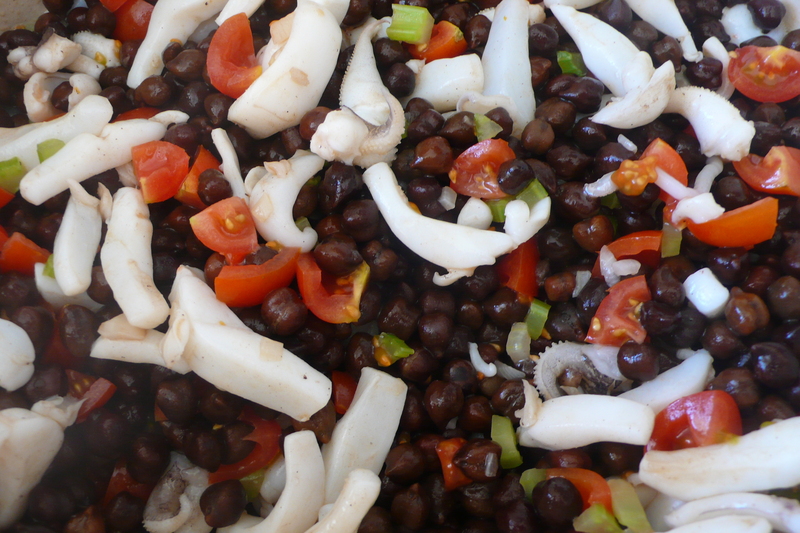 Add the cuttlefish and the ink from the sacks, if you are using them, stirring everything. 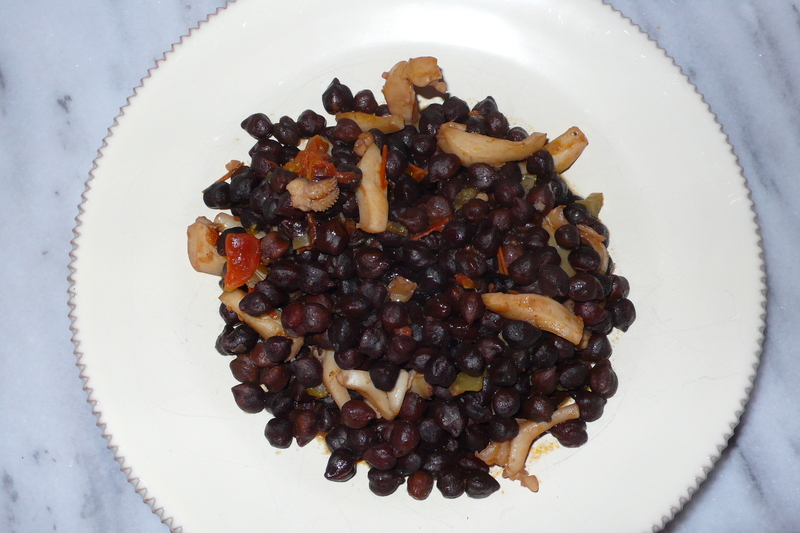 Add the tomatoes and the cooked beans, strained. Add the salt and pepper to taste. Cook for 20 minutes and if necessary add vegetable broth. Serve with crusty bread. The hiatus has been too long, the blog world must be worried that we aren’t eating here in Seattle, or closer to the reality, eating poorly. I can’t say that we have been excited by the food here. Sure, I’m happy about the plethora of good Asian restaurants and enjoying a few things that I missed when we were in Italy, but we are generally disappointed. We’re mainly disappointed in what we’re finding at the grocery store, from your general American supermarket, to Costco to the fancier shops. We don’t eat out as much as we used to, because even though I’ve mastered eating with one hand, holding my youngest in the other, I can’t say that I enjoy it, so we do most of our eating at home. After living in such a rich agricultural and fishing culture we are having a really hard time. Culture shock. Of course there are some wonderful markets, their only problem is proximity, we don’t actually live in Seattle, we are deep in the burbs, so a jaunt to Pike Place market, or the Ballard farmer’s market is an all day outing and who knows how that fish is going to smell on the way home. I’ll stop my whining, these things take time, and we need to give it its due time, either we will adapt to mediocre or we will find our gold mine… time. 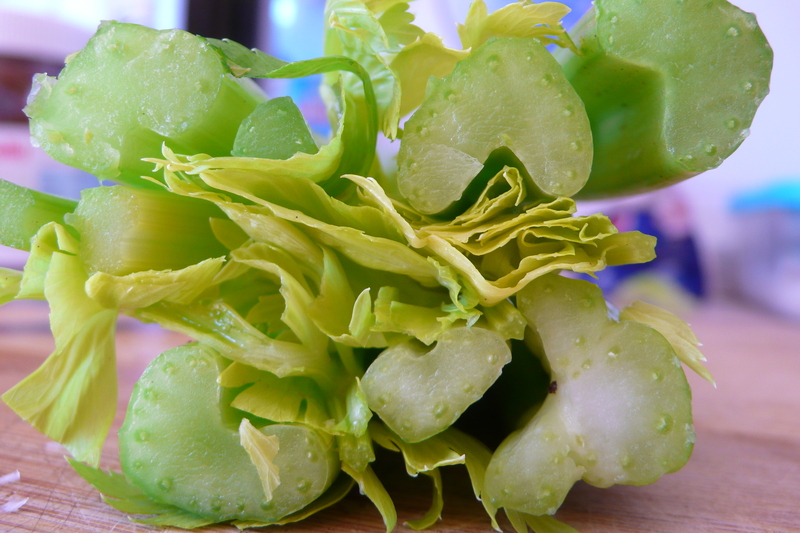 We did find these gorgeous romano beans at Pike Place market when we brought my sister to see it, they were being sold at one of the flower stands. The vendor was excited that we knew what they were and had never thought to cook them with pasta, I was excited to actually find them and that they were being sold alongside gorgeous dahlias! One last thing… salmon, it is amazing here, no doubt, but this girl is over it and I’m still on the look out for those fresh octopus. Preheat the oven to 275F. 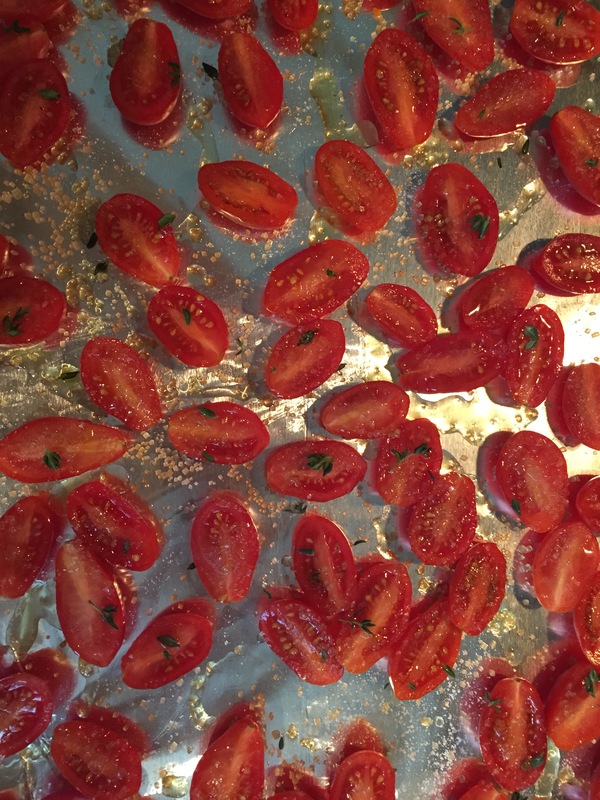 Clean your tomatoes and cut them in half, distribute on a baking sheet, sprinkle the sugar, thyme and salt evenly over the tomatoes. Drizzle on the olive oil. Place in the center of the oven and roast for about 2 hours, checking to make sure that they don’t dry out too much. 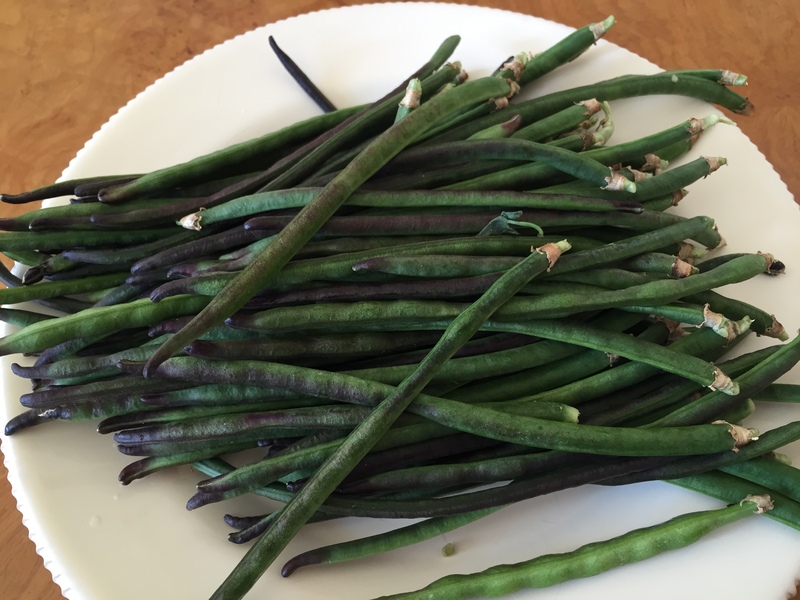 Clean the beans by snapping off the ends and rinsing under cold water, shake the water off of them and dry off with a clean kitchen towel. 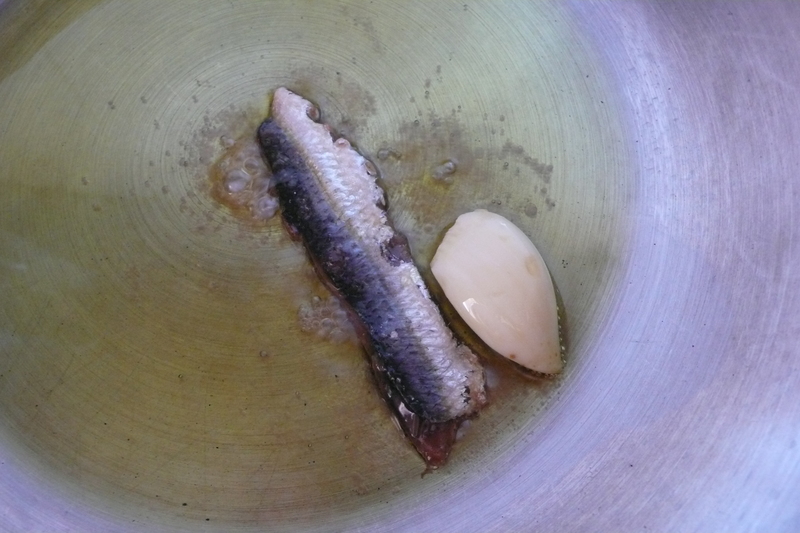 Heat oil in a wide saucepan over medium-high heat and add the clove of garlic. 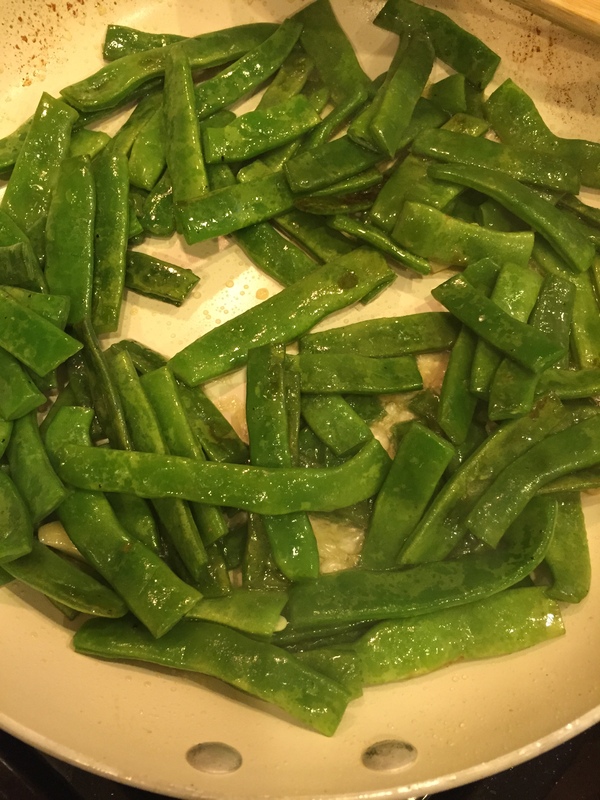 When garlic starts to sizzle add the romano beans, saute until the beans start to blister and wilt, lower the heat and add the tomato so that the flavors start to meld. Add the salmon to the beans when you have added the pasta to the water, you don’t want it to cook for too long, it can become very dry. 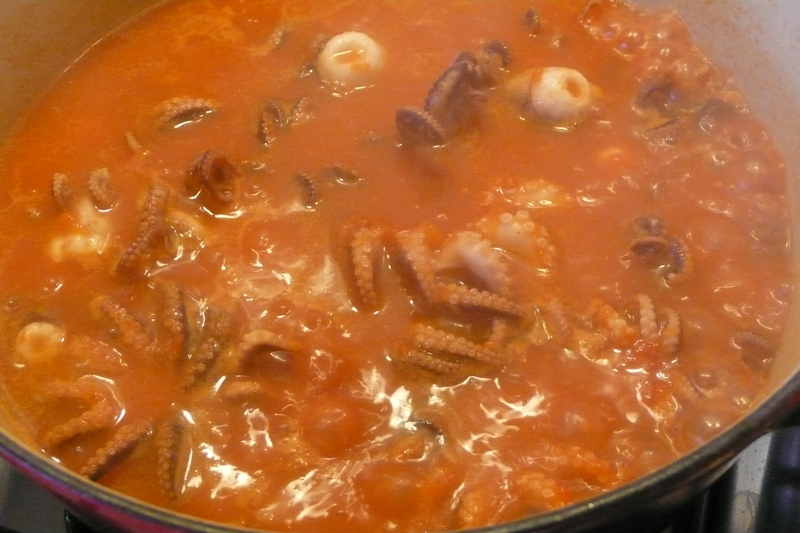 Once the water starts to boil for the pasta add a small handful of salt to the water and bring to a rolling boil. Add the pasta and cook until al dente. When the pasta is perfectly al dente, turn up the heat on the sauce and drain the pasta. 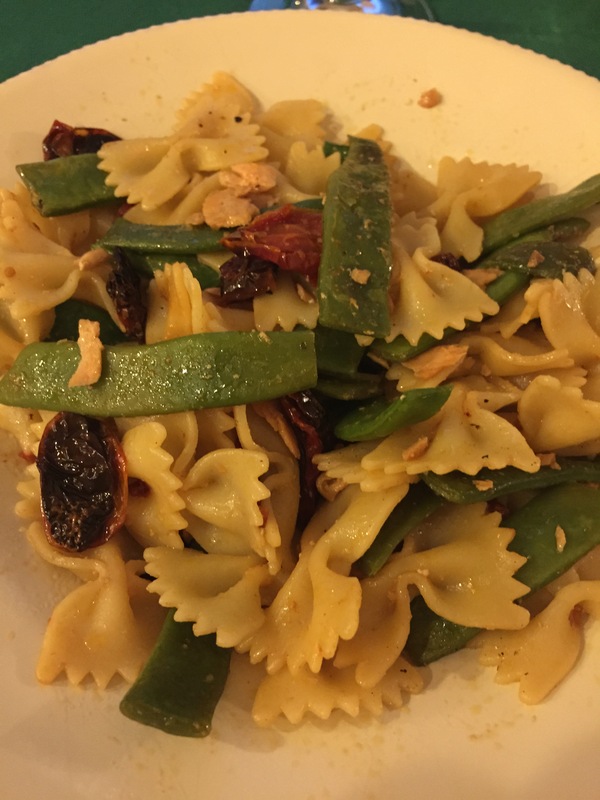 Without shaking all of the water out of the colander pour the pasta into the pan and toss it with the romano beans and the salmon. Serve immediately with freshly ground pepper to taste. 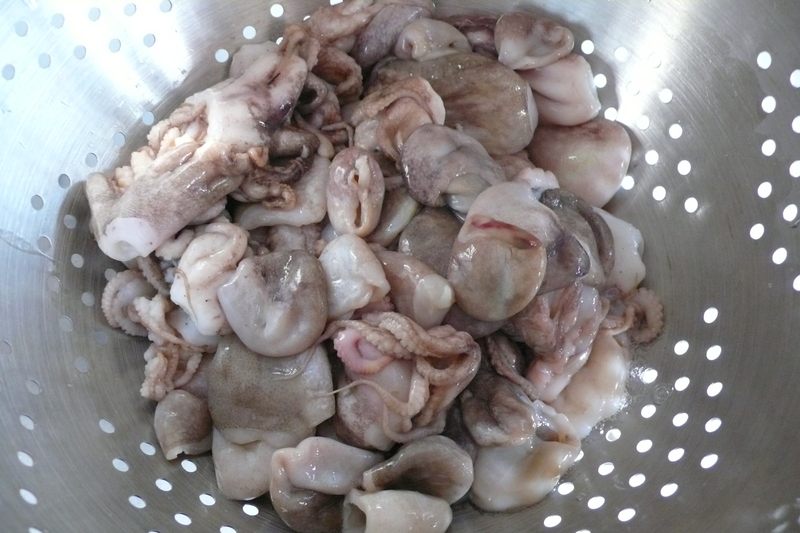 I read an article some time ago about the giant octopi that live in Puget Sound, knowing that we would eventually be moving to Seattle, I got really excited by the prospect of being able to find fresh octopus at the market. 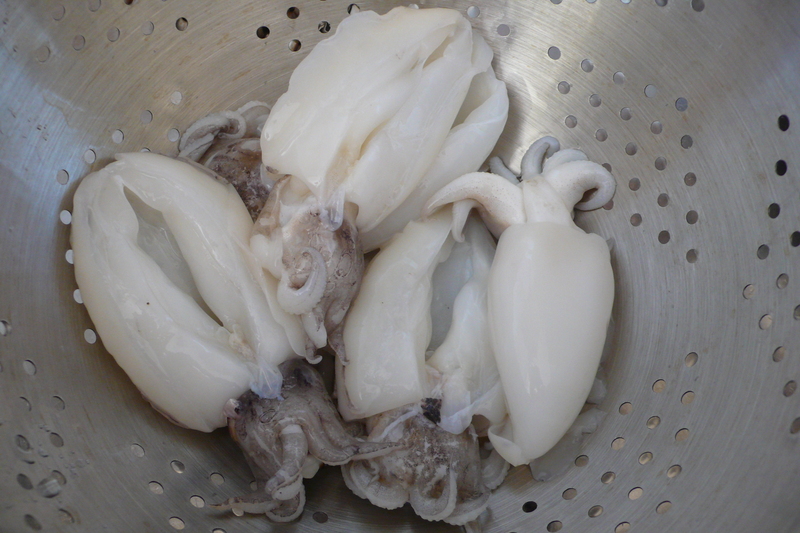 I asked the fish monger at Central Market in Mill Creek, where we are staying now, if it was possible to find uncooked fresh octopus and his answer was no. They don’t fish for octopus, there obviously isn’t enough demand for it here, but rumor has it the Sound is teaming with octopi, my hope is to figure out a way to get my hands on some fresh ones. Hopefully I will find them by the time our furniture and all of my precious pots and pans, knives, wooden spoons and cutting boards arrive, hopefully I will have found my source for local octopus by then. I can’t wait to get back in the kitchen again, to no longer have to work with one individual frying pan, plastic spoons and electric coils for cooking, soon enough my friends, soon enough. In the meantime I will drool over the thought of this pasta with these gorgeous little polipetti. My daughter may cry at the sight of them, I hope she will continue to love octopus now that she won’t be eating it as often. 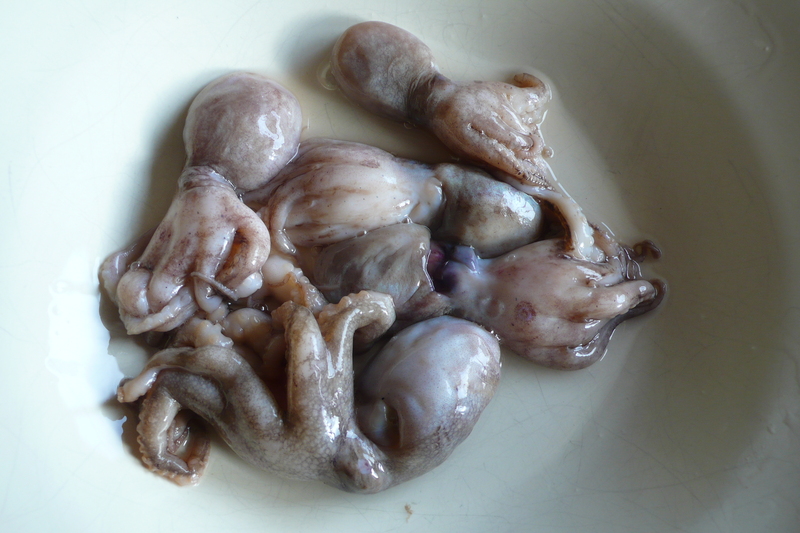 Rinse the octopi and separate the heads from the bodies. Heat oil in a deep skillet or a wide saucepan over medium heat and add whole cloves of garlic. 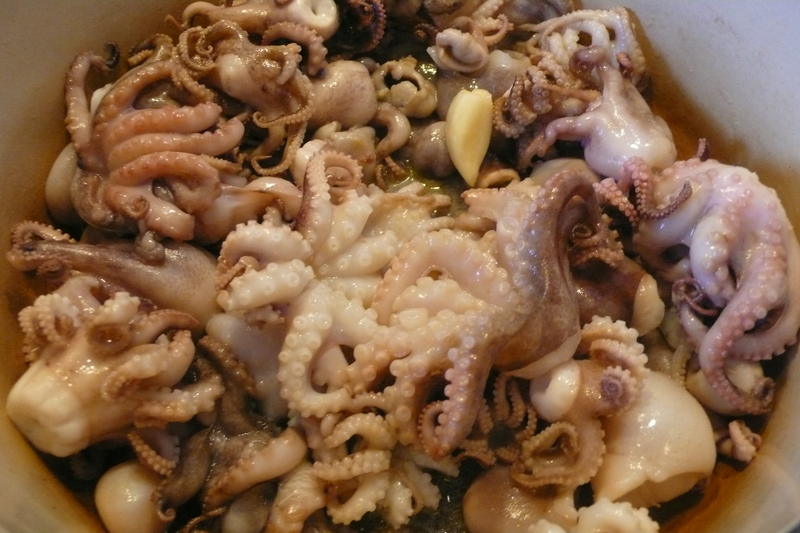 When the garlic starts to simmer, add octopus, stir to absorb the oil and when the liquid that the octopus releases starts to evaporate add the white wine. 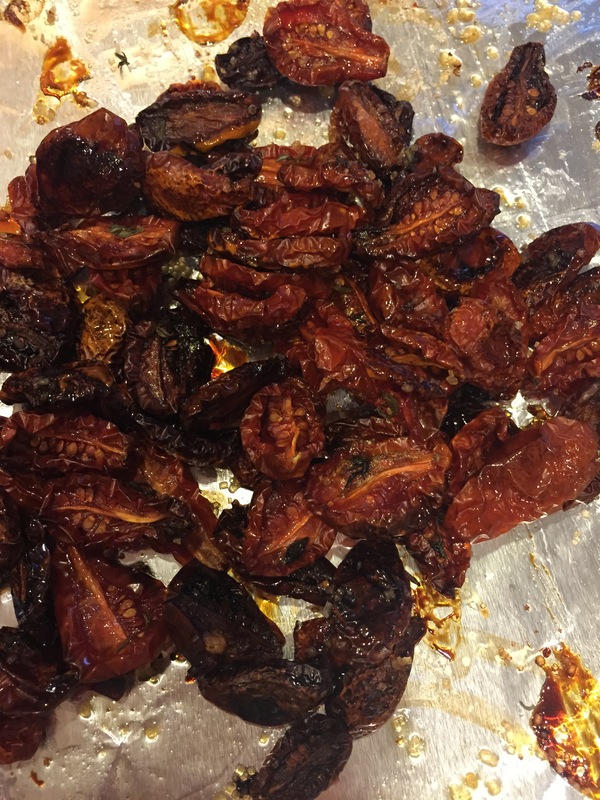 Once the wine has evaporated add the tomato and cook at a medium-low temperature for about 30 minutes. In the meantime, fill a large pot with water for the pasta. Bring to a boil over high heat. Once the water starts to boil for the pasta add a small handful of salt to the water and bring to a rolling boil. Add the pasta and cook until al dente. When the pasta is perfectly al dente, turn up the heat on the sauce and drain the pasta. Without shaking all of the water out of the colander pour the pasta into the pan and toss it with the sauce. This allows for the pasta to cook a little longer in the sauce and to absorb the flavor. Serve immediately. 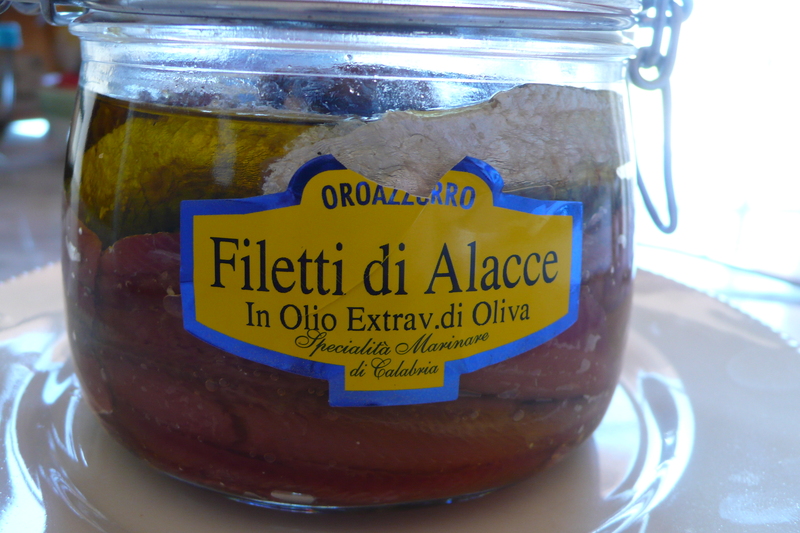 Two things that we tried our best to use up before we left Italy, capers that our neighbor cultivated and cured, and our giant jar of alacce, which are like anchovies, but larger and much stinkier. 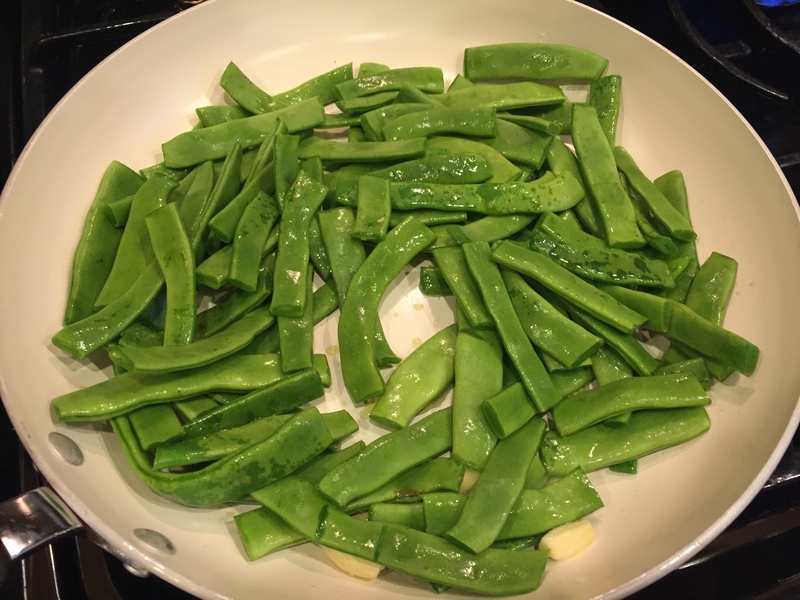 They were perfect for cooking, gave a huge flavor boost. 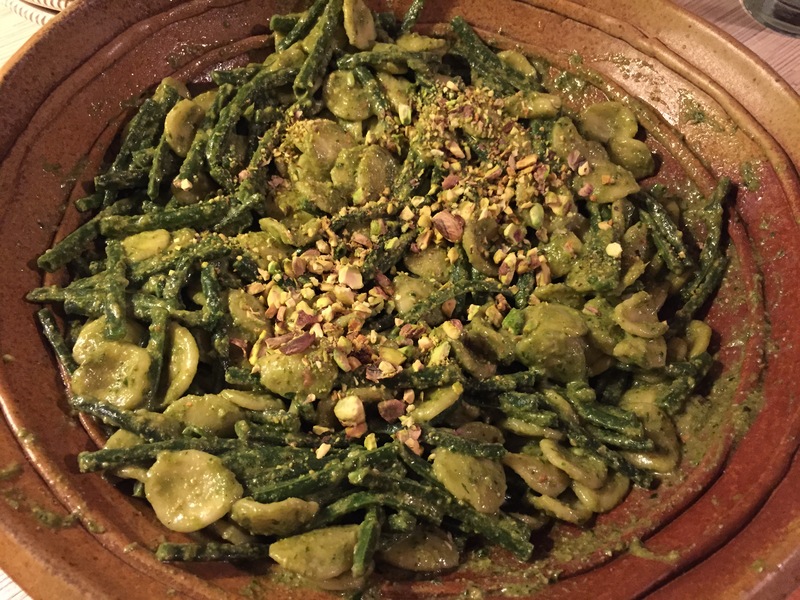 This asparagus dish provided us with the opportunity to use both and to eat the local asparagus, which was always delicious. 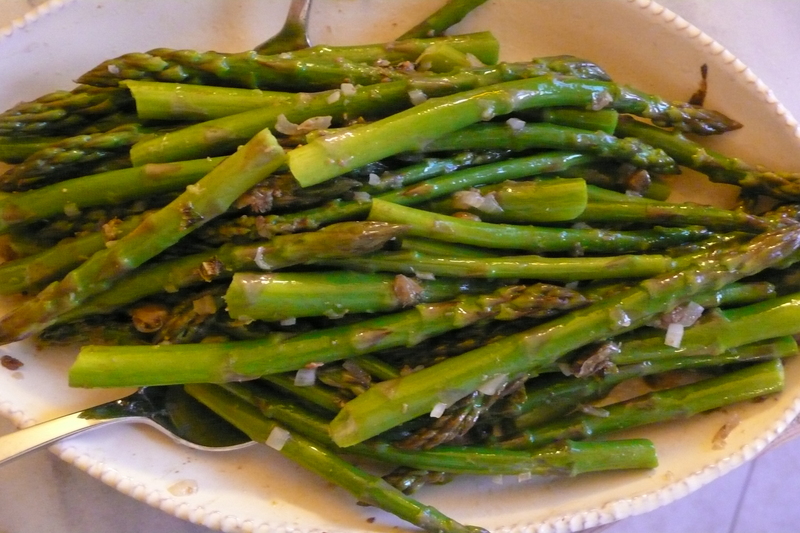 I love asparagus, but I tend to be a little boring with it. 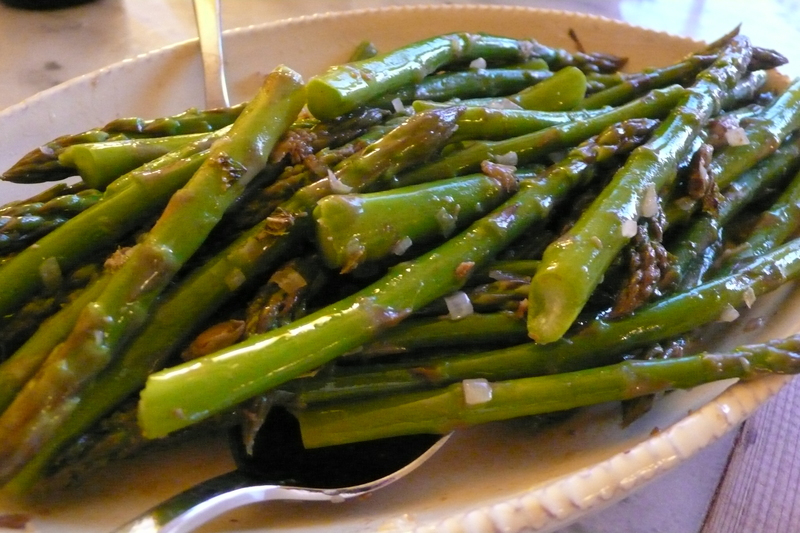 My mother usually just steamed it, which was always good, we would only taste the asparagus, but I like to liven it up a bit and this recipe was the perfect way to do that. I may not make asparagus any other way! 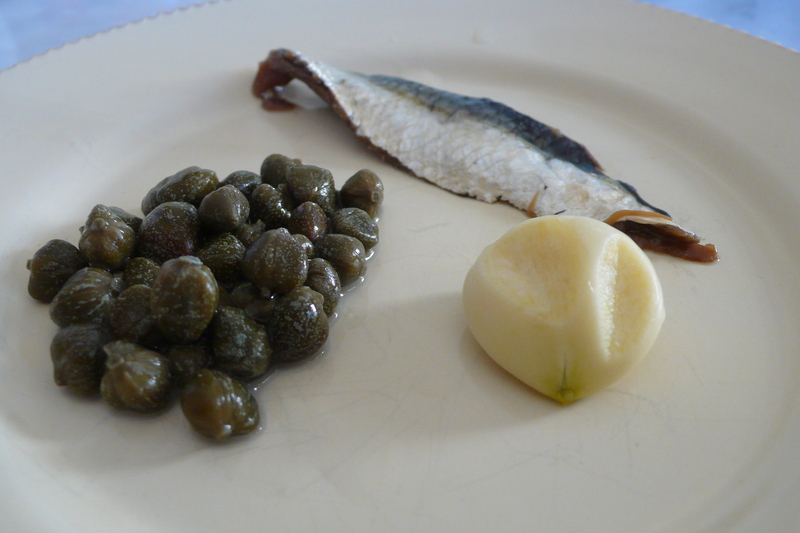 Place the garlic, anchovy fillets and capers in a mortar and pestle, and mash to a paste. Heat 1 tablespoon of the olive oil over medium heat in a small skillet. 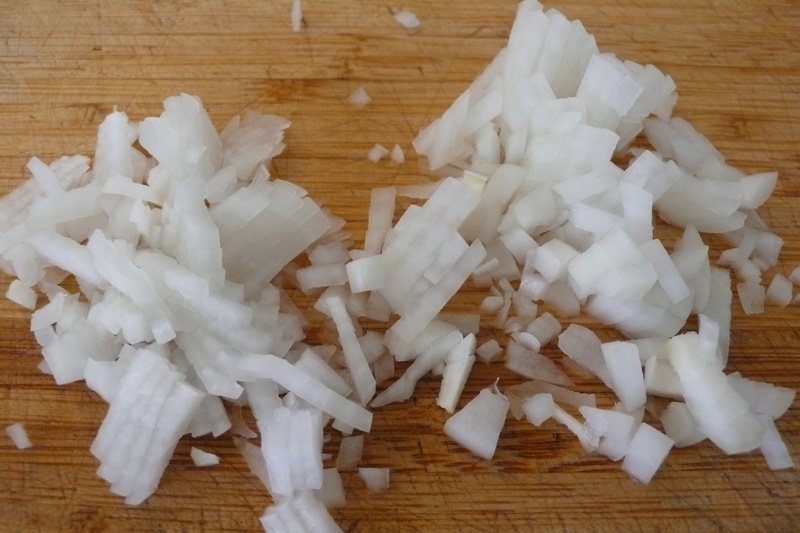 Add the onion and a pinch of salt. 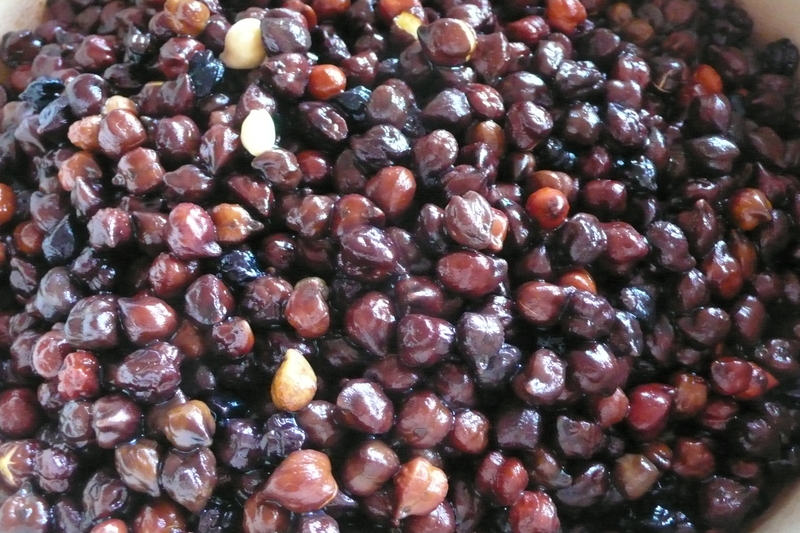 Cook, stirring often, until tender (do not brown), three to five minutes. 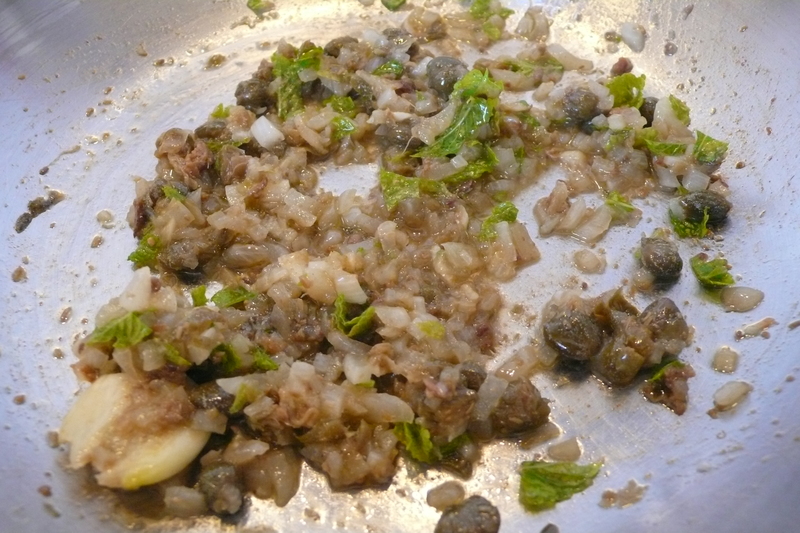 Stir in the garlic and anchovy paste, and cook, stirring, for another minute. 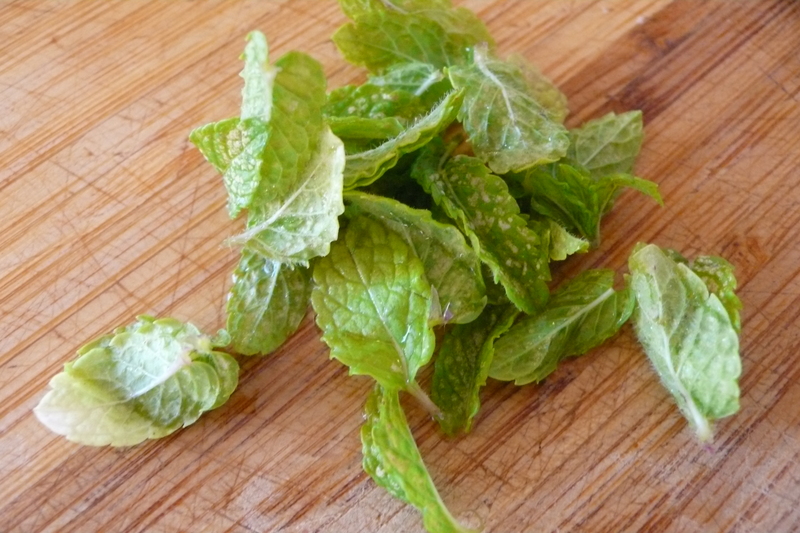 Remove from the heat, and stir in the lemon juice, mint, salt and pepper. Set aside for 15 to 30 minutes or longer. The flavors will mellow. 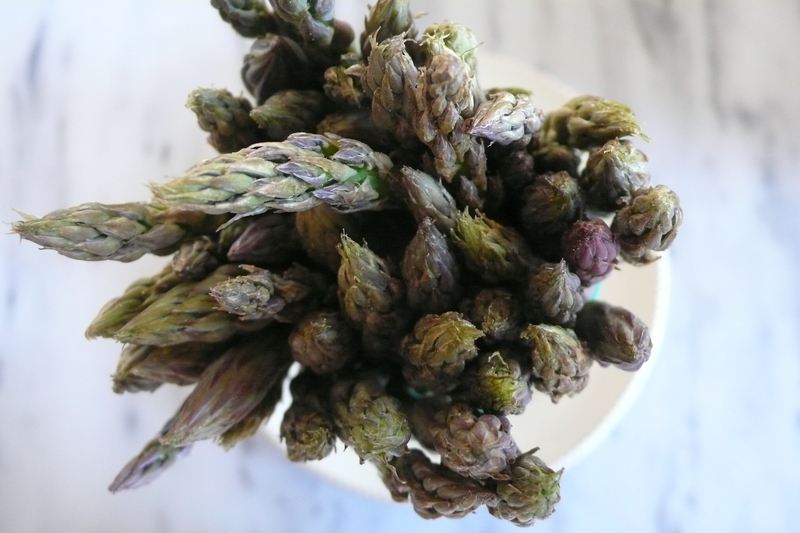 Steam the asparagus for three to five minutes until just tender. 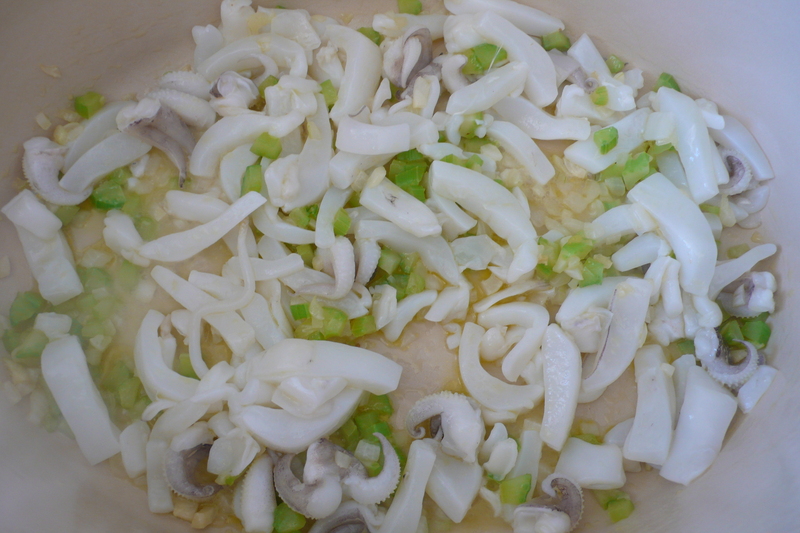 Remove to a platter or a wide bowl, and add the remaining olive oil and the onion mixture. Toss gently and serve. An excuse? Yes, I have several excuses for not having posted in a month. 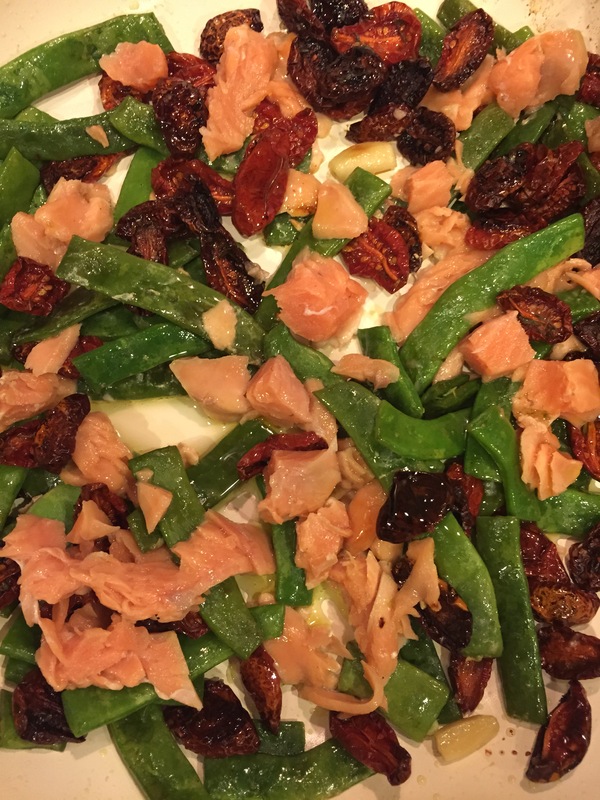 My most obvious is summer with two kids at home, one a very small (yet swiftly growing) infant, but the biggest hold on my culinary creativity has been a major move. Several weeks ago movers arrived at our doorstep in Grottaglie to pack us up to move to the other side of the world, Seattle that is. We returned to the hotel where we had first begun our Pugliese adventure and have been in a suburb of Seattle, in temporary housing, for almost two weeks now. Our furniture and the rest of our “goods” won’t be here until September, so this neutral colored apartment is home for now. This gorgeous pasta was the last meal that I made in our Italian home, with all of those glorious ingredients. 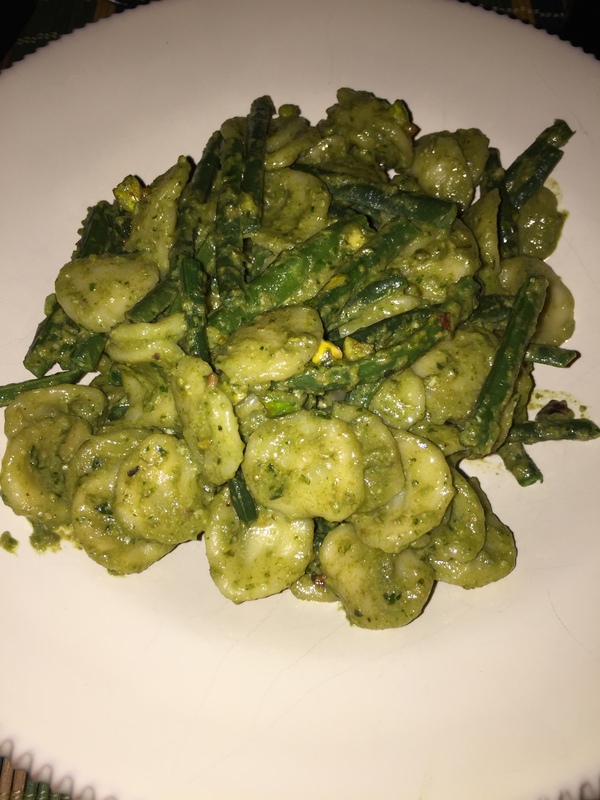 I have been looking forward to this move, but I knew from the moment that the decision was final that I would miss the freshness as well as the low cost of the food in Puglia. Gorgeous cacioricotta, fresh basil and unique local green beans. These orecchiette weren’t made by hand and their freshness is from a refrigerator package from the grocery store, but they are good, very very good. Don’t get me started on the olive oil, the one thing we meant to bring with us, but with the chaos of leaving we forgot to buy it. Our last month in Grottaglie we were using the olive oil that our neighbors had pressed from their own trees and given to us, poured into a plastic fanta bottle, to die for. I really don’t want to complain, the Asian food section alone at the grocery stores here make me swoon and cilantro, oh cilantro, I’ve missed you so. I can’t deny that food is expensive in America, very expensive. Mediocre sliced bread costs 4 times what freshly baked artisinal bread cost in Puglia, fruits and vegetables are precious jewels and I knew that seafood would be more expensive, it is everywhere but Puglia. I’m already getting creative in the kitchen, despite my coil stovetops, come September I’ll have a gas stove again and will be fully settled in. 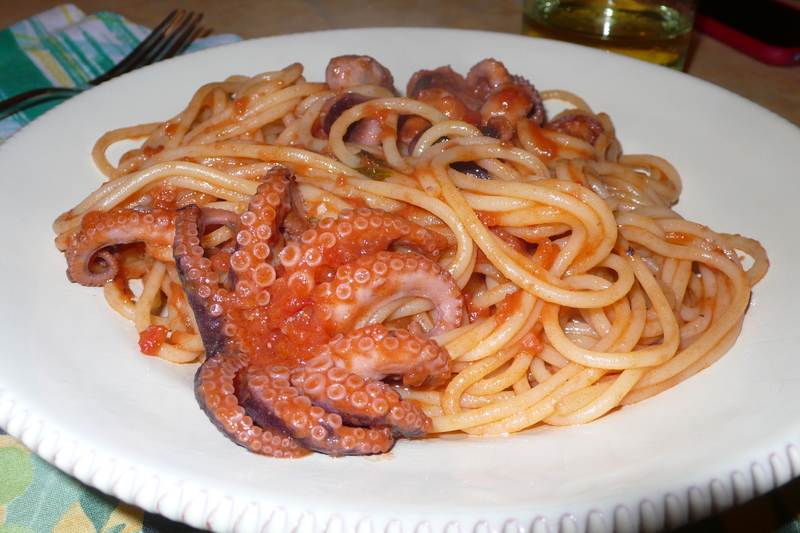 In the meantime I’ll post my last few recipes from Puglia, maybe a few new ones here and there. Begin heating a large pot of water for the pasta. 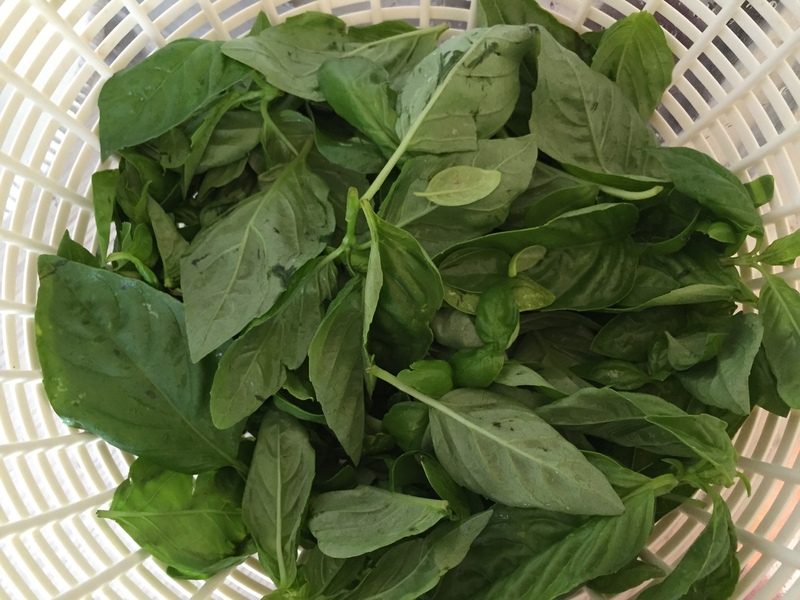 Meanwhile grind the basil leaves and pistachios in a food processor fitted with the steel blade, or in a mortar and pestle. Add salt to taste and slowly drizzle in the olive oil. Blend or grind until smooth. 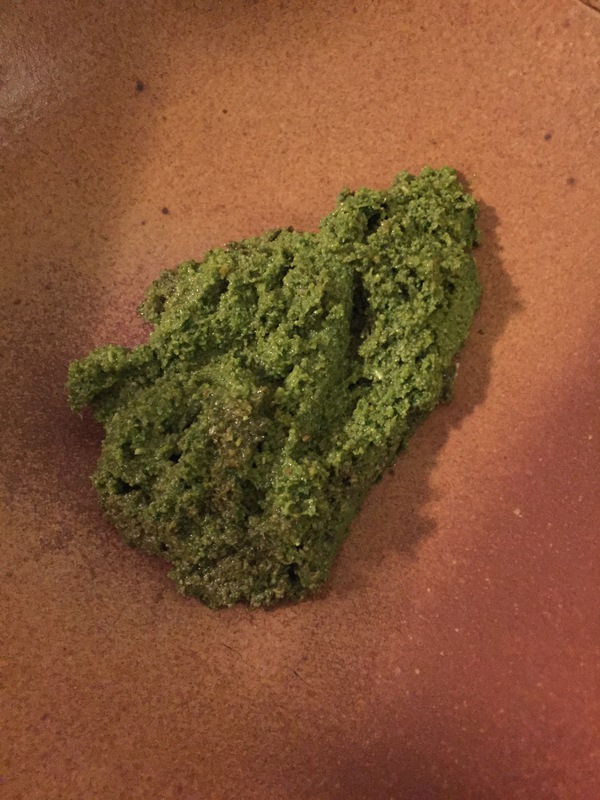 Mash the garlic in a mortar and pestle or through a garlic press and add to the basil mixture. Blend together. Add the cheese and blend together. Taste, adjust salt and add pepper. Transfer to a large pasta bowl. When the water comes to a boil, salt generously and add the orecchiette. 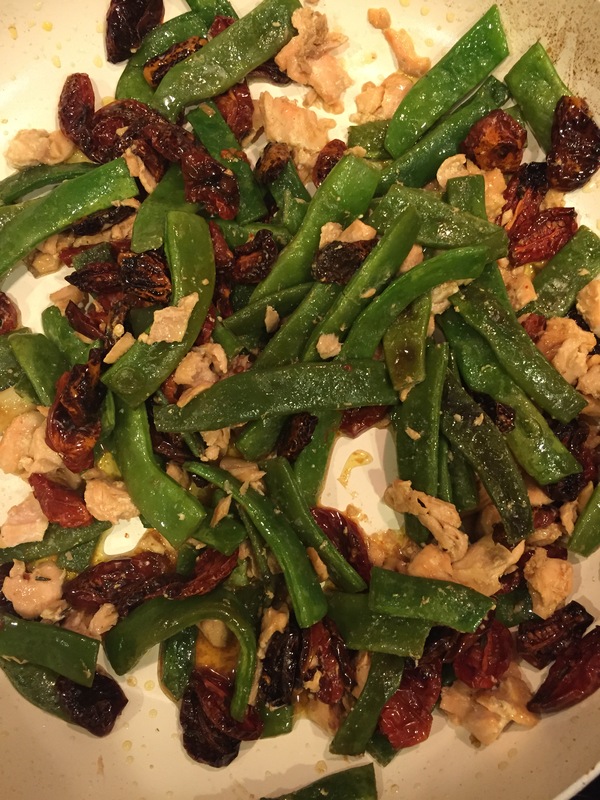 Set the timer for 10 minutes, and after 5 minutes add the green beans. Boil the orecchiette and beans until the pasta is cooked al dente, another 5 to 6 minutes. 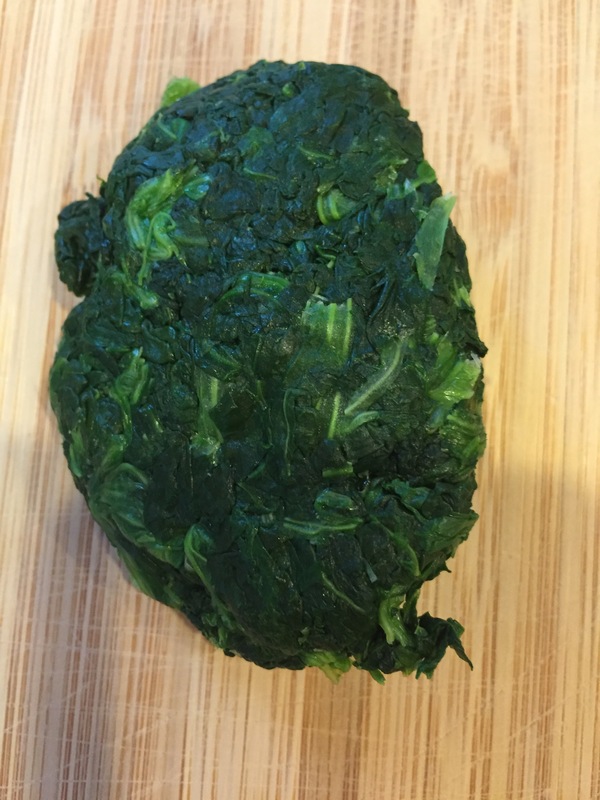 Remove 1/2 cup of the cooking water from the pot and add 2 to 4 tablespoons to the pesto. Stir with a fork or a whisk until the pesto is smooth (add more water if desired). Drain the pasta and beans, toss with the pesto and serve. 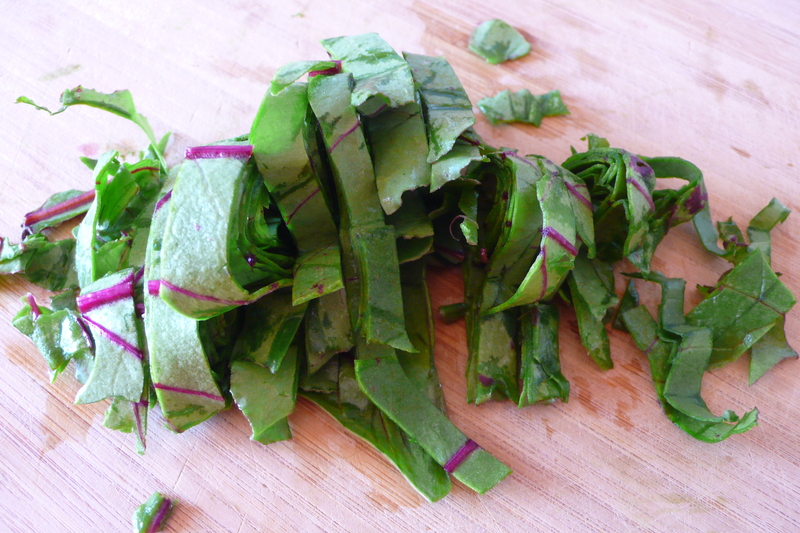 Despite the fact that my daughter is no longer elated with a plate of pink pasta, and instead of diving into a steaming plate of fucshia, she questions it with a snear, I have to admit that I still get excited. 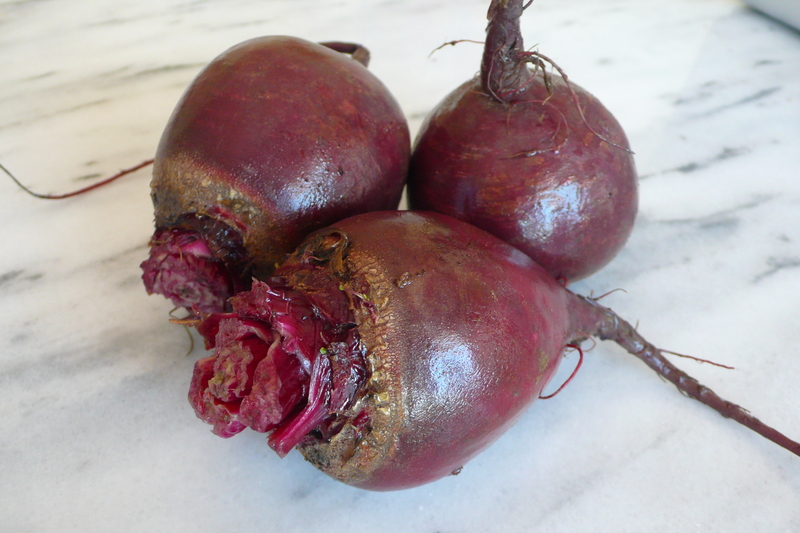 I love the power of a plant that can turn something from an off-white into a deep pink with a few tosses in the pan and to top it all off, it is extremely good for us. 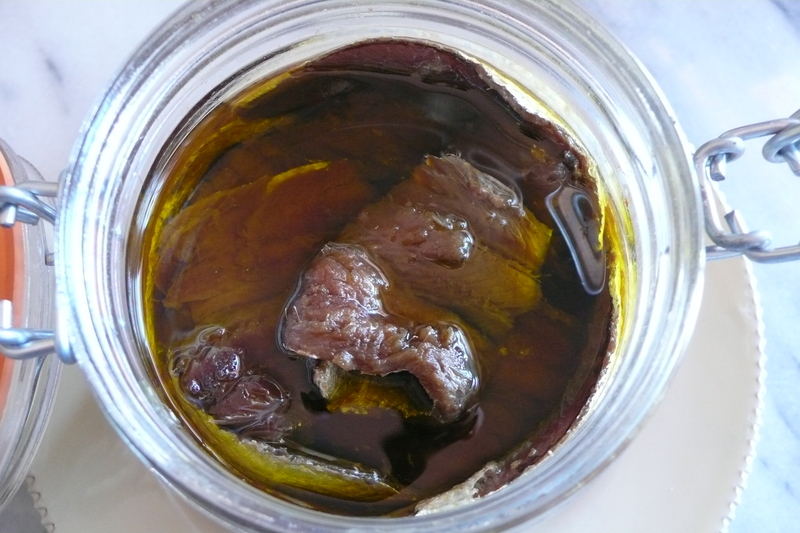 Heat oil in a large pan over medium-high, add garlic and anchovy filets. 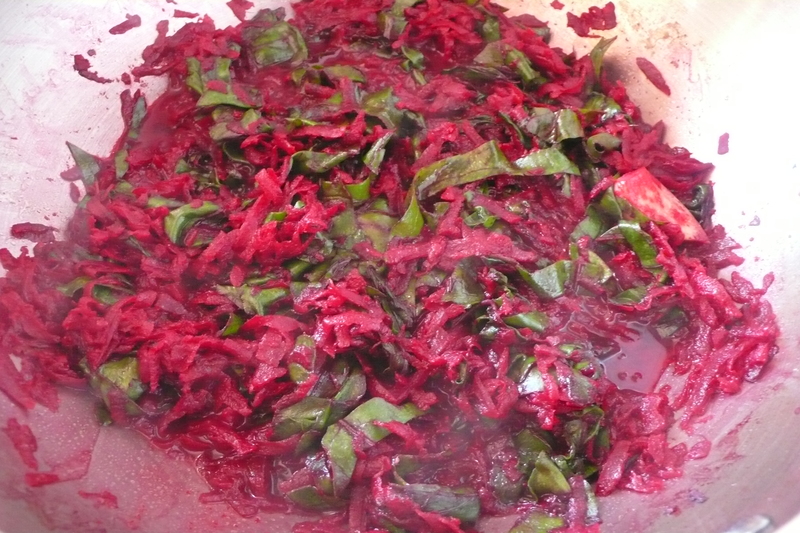 When the garlic starts to sizzle add beets. 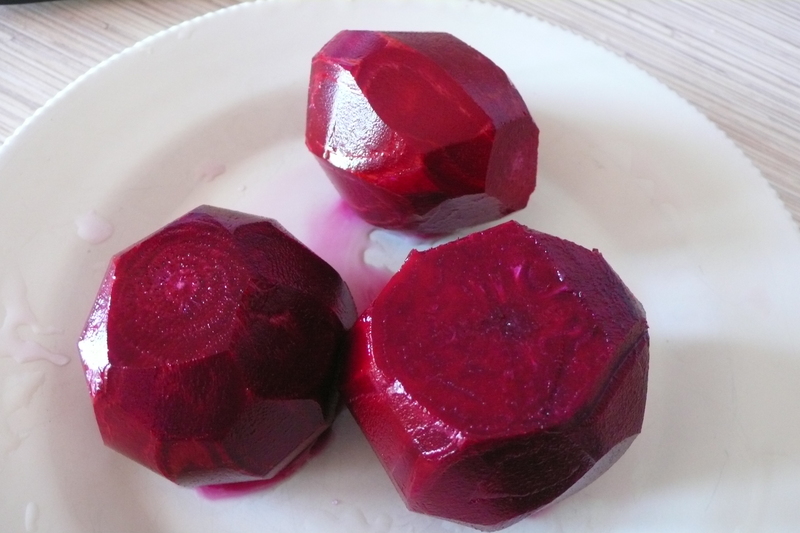 Reduce heat to low, cover and cook until beets are very tender, about 10 to 15 minutes. 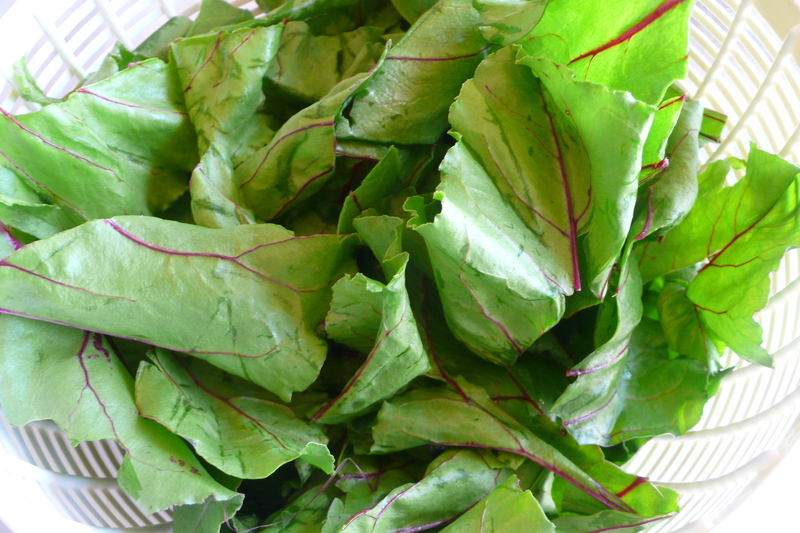 At this point add the beet greens. When the pasta is about 1 minute from being cooked to al dente perfection, turn up the heat on the sauce and drain the pasta, reserving a small cup of water. 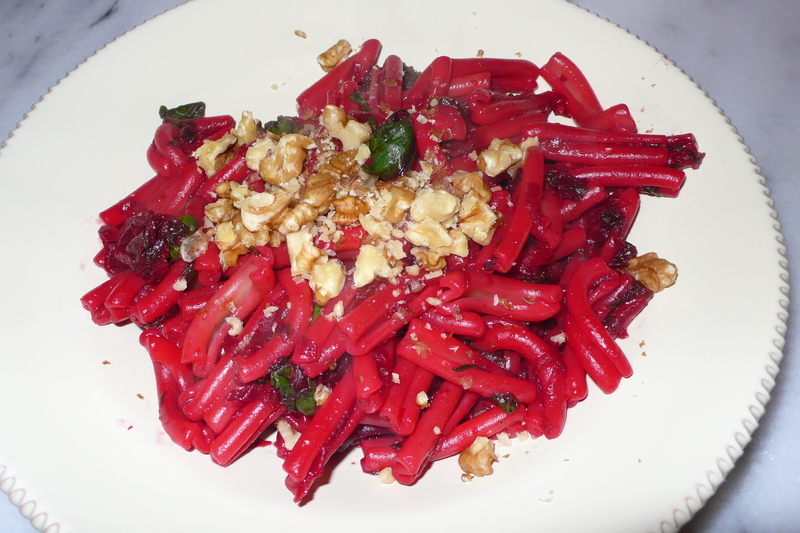 Without shaking all of the water out of the colander pour the pasta into the pan and toss it with the sauce, finishing up the cooking in the beets, add the reserved water if it seems dry. 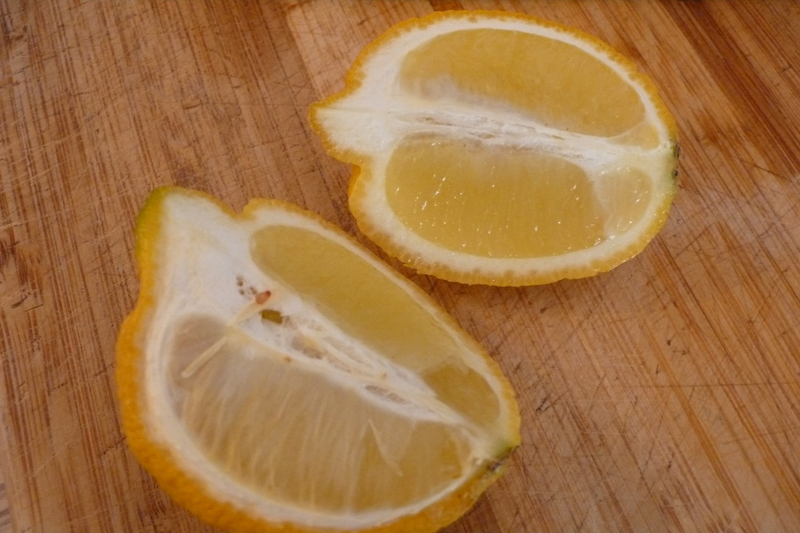 Remove from the heat and toss with chopped walnuts, serve immediately.